Our kids have been involved in our vege garden even before they could walk. I think understanding where our food comes from really helps. In the kitchen, the younger ones help peel veges or simply put the chopped veges into the saucepan. The older kids get to help cut up food, test whether its cooked in the saucepan, and try following recipes to prepare meals. They all help with their own lunch boxes for school, and have limited access to junk food. They understand that junk food and take away food are occasional treats, and for special occasions. We talk a lot about healthy foods, what animals eat what and how they’re grown. My daughter is only 3 but is super interested in how veges are grown. We have plans to start our own vege garden very soon! Yes it all stems back to the parents. Growing your own veggies and eating them is the best thing that you can do. You need to show the kids the good choices in life not the bad ones. And you need to start from the word go. Thanks for sharing this article. I think my son has learnt a lot from childcare. He enjoys his veg but also likes his sweet snacks. I find having them grow a garden they tend to try different foods as well. yes i grow a little garden so that my kids can get hands on experience. that is how i learnt about vegies. 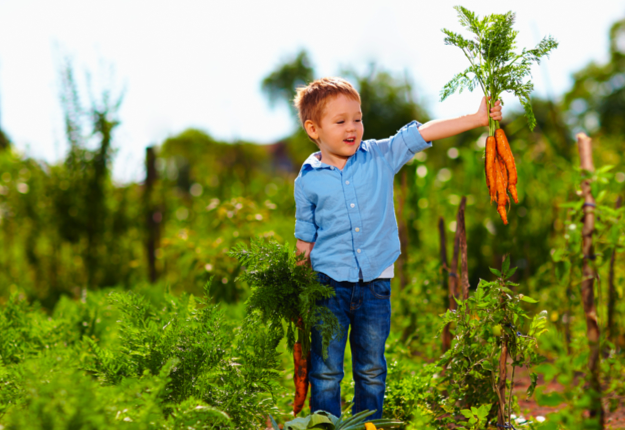 it also makes kids more excited to eat what they have been growing. cheers for promoting ideas such as this one. Our little one loves growing food and helping cook dinner. Instead of there being good food and bad food we have healthy body food and special treats. Lots of healthy body food gets her very excited. I am very glad that my parents introduced us different food when we were little. As living in asia, there are more variety of fruits and vegetables available. Everyday we have to try different ones. The idea was just to try, if we don’t like it we discard it from the list. Dad said our palate changes as we grow older and other food can be introduced at a later phase. Which I followed with my own kids and they are happily trying without a big fuss. I’m lucky and my child actually loves eating fruits and veg!! We’ve started solids mot long ago but I’m planning to involve my baby girl in food prep as soon as possible but most importantly to lead by example. I have to educate about healthy eating and this means to lead by example.